How do you prefer your castles — medieval or Renaissance? Visitors to Bourdeilles in the Dordogne (24) don’t have to choose. 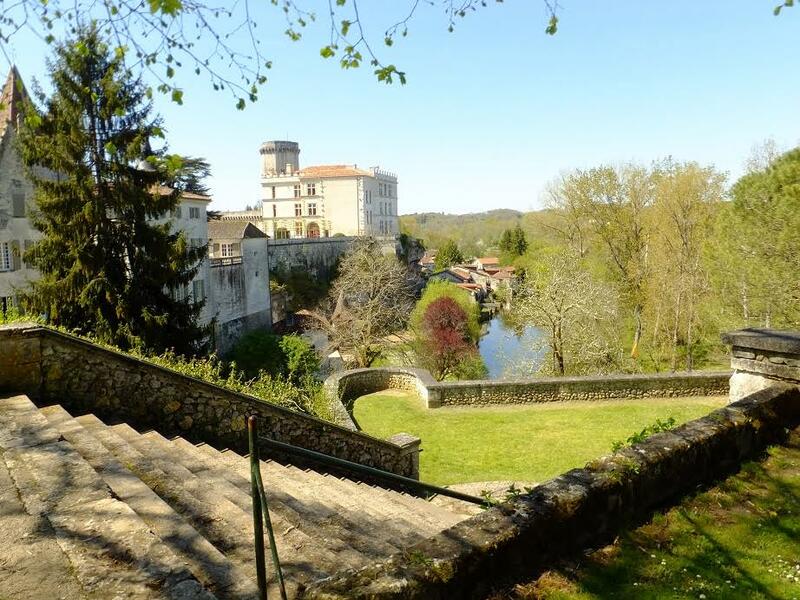 This château complex overlooking the Dronne river includes a feudal fortress built between the 13th and 14th centuries alongside a fancier Renaissance palace built 200 years later. The palace was commissioned by Jacquette de Montbron, a lady-in-waiting to Catherine de Médicis and wife of André de Bourdeille. The Italian-inspired design of the château is due to Montbron’s tastes. We have no trouble finding a shady parking spot near the church in Bourdeilles. We have a coffee while waiting for the château to re-open after lunch. 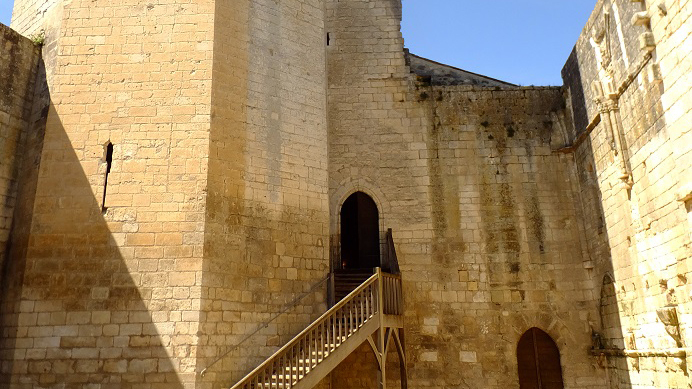 After we buy our tickets in the gift shop, we cross through a stately outer courtyard and into the cour de château comtal — the inner fortress surrounded by high walls. 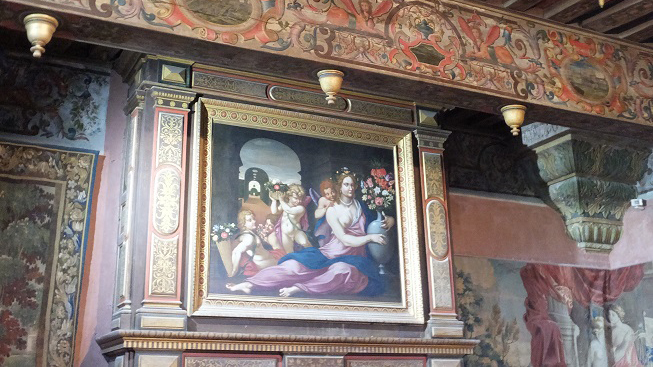 Just beyond, the spacious and bright Salle d’honneur contains a couple of fireplaces large enough to stand in. Château de Bourdeilles is comprised of two castles: one from the Middle Ages and another from the Renaissance period. We're feeling fit, so we tackle the steep winding steps to the terrace at the top of the octogonal donjon tower where we are rewarded with superb views of the village and beyond. 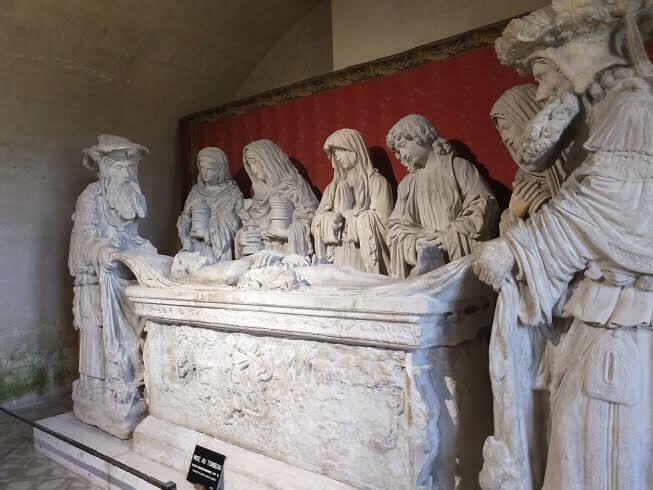 This large funeral monument is located in the chapel at Château de Bourdeilles. Next up is the Renaissance château which encompasses three floors with several furnished rooms and lovely pieces of furniture, many of which are Spanish, lining the corridors. 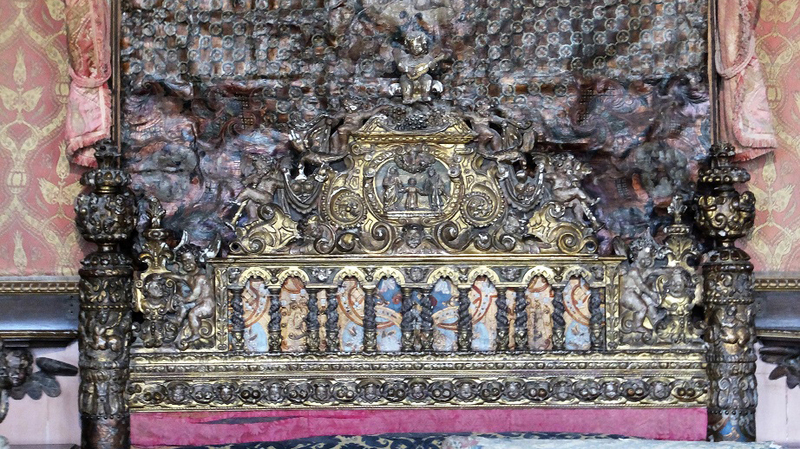 Most notable is the gilt “Paradise Bed” once slept in by Charles V.
On the day of our visit, gardeners are just starting the spring planting in the two modest-sized palace gardens. 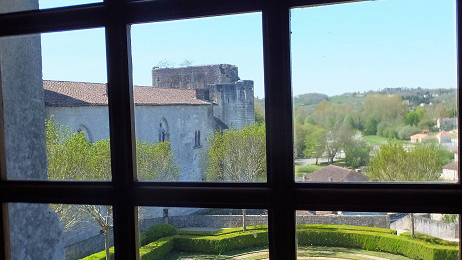 I’m sure they will be lovely in a few weeks, but we don’t have to wait to admire the views from the château walls. Château de Bourdeilles is open all year round, except January, and every day except Mondays. In July and August, hours and days are expanded, so check their website for current hours and special events including children’s activities, night visits and a new virtual reality escape game. Visitors to Château de Bourdeilles can climb to the top of the octagonal tower. 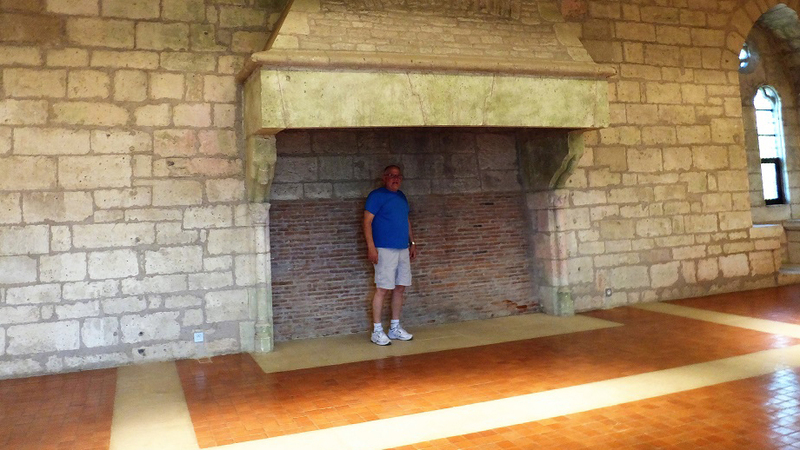 Fireplaces in the Salle d'honneur at Château de Bourdeilles are large enough to stand in. 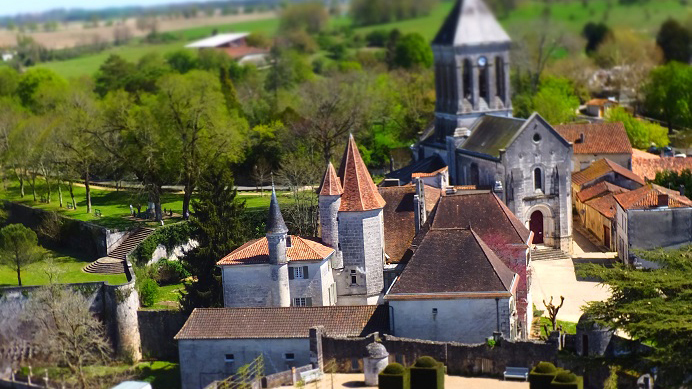 The palace garden and village church are seen from the top of the tower at Château de Bourdeilles. Charles V slept here in this fancy bed at Château de Bourdeilles. 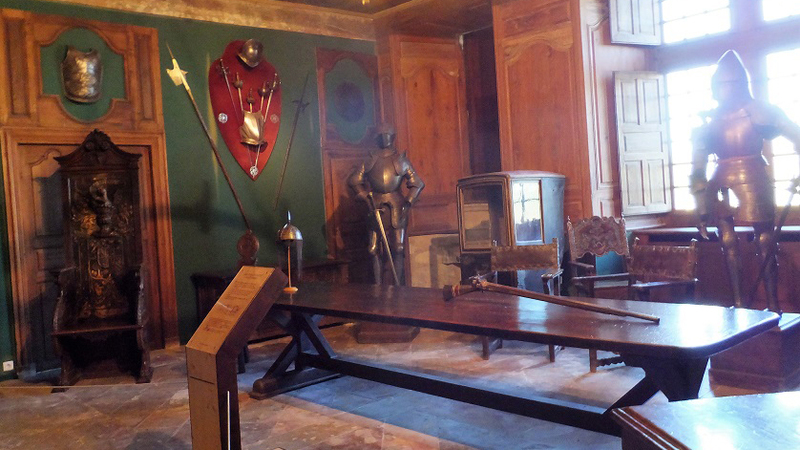 Armor and weaponry are the themes in this room at Château de Bourdeilles. Intricate inlaid decorations adorn the ceiling and walls in this room at Château de Bourdeilles. One of the gardens at Château de Bourdeilles is seen from an upstairs window. 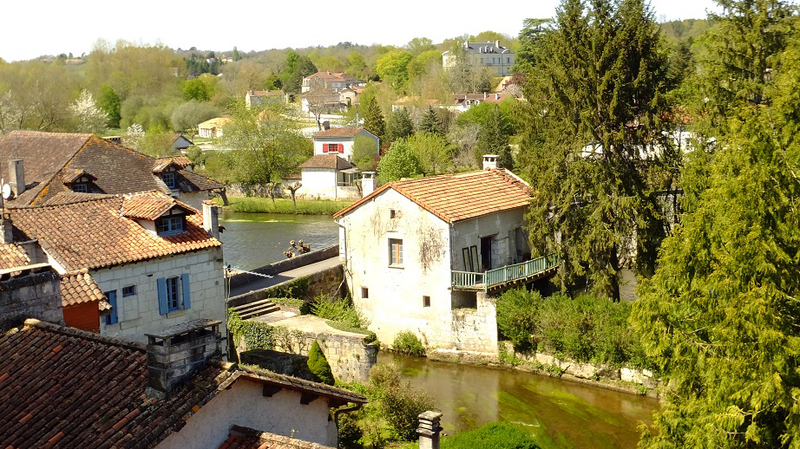 The village nestled along the Dronne river is seen from a window at Château de Bourdeilles. 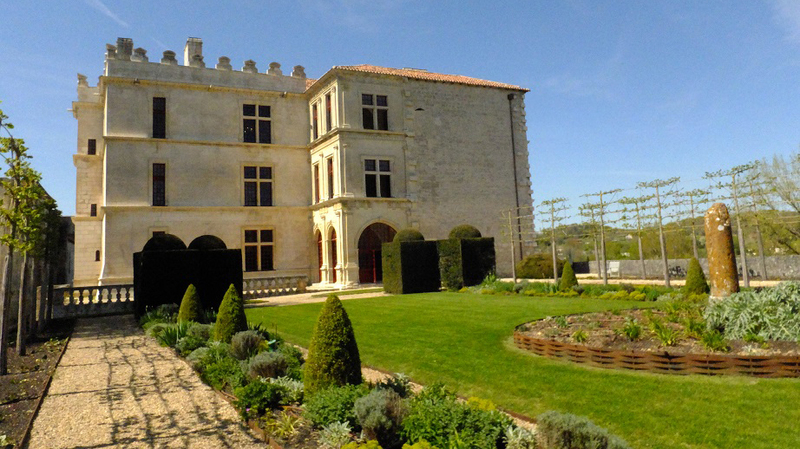 The gardens at Château de Bourdeilles enjoy one of their first sunny spring days.